In order to assist your needs, MaxPreps and the WIAA have created step-by-step instructions to edit games, upload a team photo and upload your team's roster. Go to MaxPreps.com and sign in. On the team page, click "Schedule/Results" on the top navigational tool bar. Locate the game you wish to edit. Click the icon under the column "Edit/Delete." Change the information that is incorrect and save. On the team page, on the right hand side of the page locate the Mascot & Team Photo shaded box. Click on the “Photo” button. A shadow box appears, click on "Choose File." Select the file you wish to upload and press "Submit." Note: The file must be smaller than 5 MB. On the team page, click "Rosters" on the top navigational tool bar. Click on the "+ Athlete" green button to add an athlete. To edit an athlete's information click on the yellow icon of a wrench. Download the linked EXCEL FILE. Open the excel file. Important, keep the headers as they are listed. Feel free to arrange them in any order. Fill out the appropriate information in each column. Each column has specific criteria/requirements for the data being entered. Click here to see the rules for entering information for Football, Volleyball and Soccer. 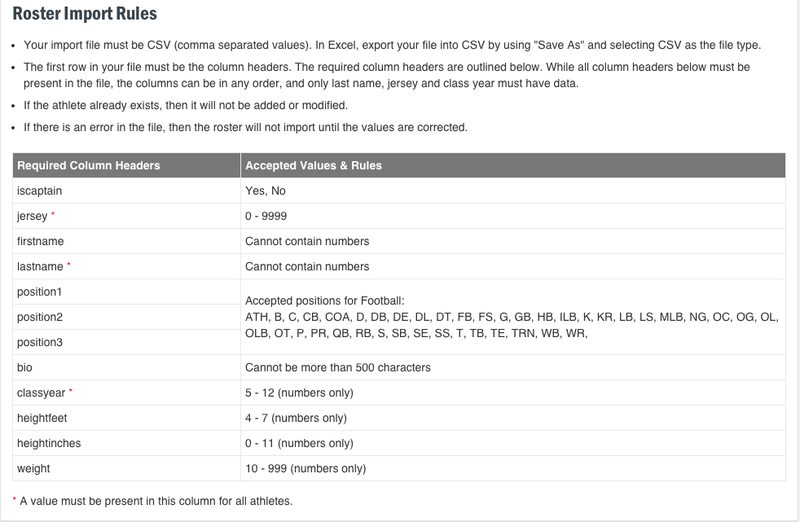 Once you finish updating your roster in the Excel document, click "File < Save As," and then save the file as a CSV (Comma Separated Value). Click on "Roster" on the top navigational tool bar. 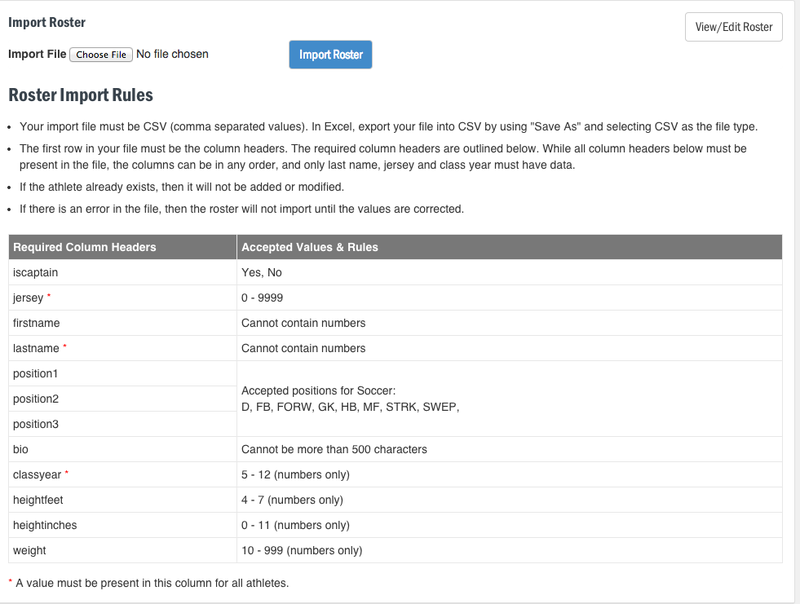 Before importing make sure your CSV file follows the Roster Import Rules with required column headers and follows the accepted rules and values. This is outlined below in step 4. Select “Choose File,” seclect your CSV roster file saved to your compute and select "Import Roster." In the right hand corner, you'll see the greeting "Hi Your Name." Click on your name and then click on your school under AD Accounts. Under AD Utilities, click on "Manage Teams." Locate the sport you wish to modify, and on the right hand side, click "Manage." From the drop down menu, select varsity. Under Coach Admin, select "Login to Coach Admin." 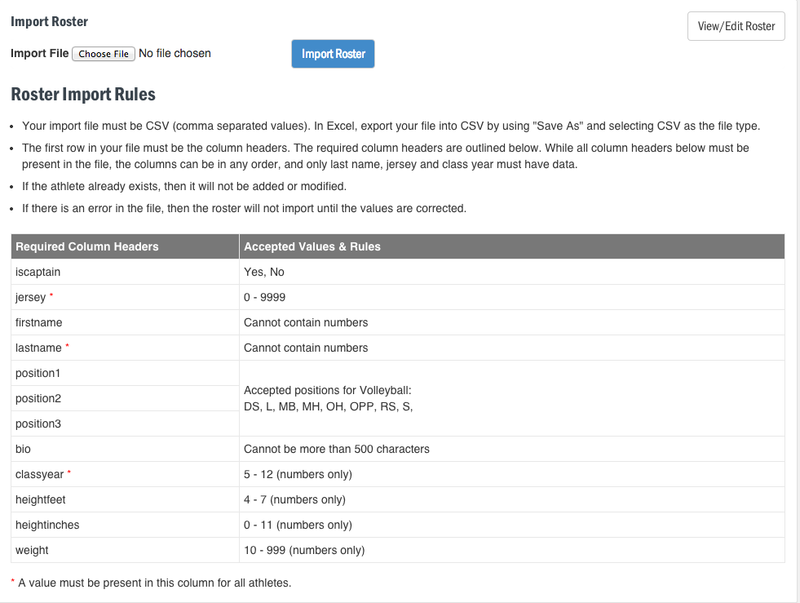 Select “Choose File,” select your CSV roster file saved to your computer and select "Import Roster.